The Brother SE425 sewing machine allows sewers to explore their creative sides through a variety of sewing, embroidery, crafting, and quilting options. The large range of sewing features that this machine possess allows anyone to add the right amount of personalization to all of your projects. This machine includes a large and versatile 67 unique built in stitches, that includes 10 one-step buttonholes. There are also 98 different stitch functions, meaning you’re sure to find the right one for your needs. Overall this is a great machine and fantastic value for money. A must have for every sewing enthusiast! 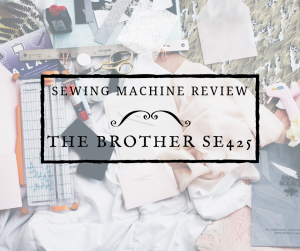 In this review of the Brother SE425 Sewing Machine I am going to give you all the information I can to help you decide if the Brother SE425 is the right machine for you. I will cover the general specs of the sewing machine, the features, a few things that I really liked about the machine, and even a couple of things that I did not like so much. For those who are completely new to sewing, below I have added little background on Brother as a company. Throughout this review, I will go over all of the specifications and functions that the machine offers you, along with any downsides that may come with it. Is The Brother SE425 Easy to Use? Yasui Sewing Machine Co. was established back in 1908 by Kanekichi Yasui. Kanekichi was the father of the founders of Brother Industries, Ltd.
At a young age the eldest child, Masayoshi Yasui, began helping his father by working as an apprentice in Osaka. With the way the sewing machine market was back then, Masayoshi was determined that he would turn the import based sewing machine industry into an export based industry simply by introducing domestic production. While many had their doubts his determination remained strong as he began developing and selling hydraulic presses to produce straw hats. While doing that he also pursued research regarding the manufacturing of sewing machines. His research finally paid off when his younger brother and co-founder of Brother, Jitsuichi Yasui, successfully developed shuttle hooks, one of the main components that make up sewing machines. It was in 1932 that the brothers were able to introduce their sewing machine, the first to be made completely in Japan. The motto of Brother has been what has driven them since very early on. Their motto “superior quality and diligent service” is a key to their company’s continued success and shows their dedication and commitment to producing products with real value, and it is something that gets passed down to every employee of Brother. The Brother company started in 1908 is a company that is truly dedicated to their mission of creating and delivering superior value to their customers through high quality and service in a speedy manner. The Brother SE425 sewing machine allows sewers to explore their creative sides through a variety of sewing, embroidery, crafting, and quilting options. The large range of sewing features that this machine possess allows anyone to add the right amount of personalization to all of your projects. This machine includes a large and versatile 67 unique built in stitches, that includes 10 one-step buttonholes. There are also 98 different stitch functions, meaning you’re sure to find the right one for your needs. 67 Built-in Sewing Stitches: This model comes with 67 different built-in sewing stitches. These stitches include utility stitches, quilting stitches, heirloom, and decorative stitches. The number of available stitching options enables you to work on a variety of projects and crafts quickly and easily without having to decide on just one stitch. With the numerous stitching options, you will have the perfect stitching for everything. 170 Embroidery Designs: The Brother SE425 comes with 170 embroidery designs for those with a passion or need for embroidery. 70 of your designs are built-in to the sewing machine while the remaining 100 are on a CD for you to browse through and choose. You also get 5 different embroidery fonts for your personalization needs and 120 frame pattern combinations. ​Large 4” x 4” Embroidery Area: The machine comes with a large 4” x 4” embroidery area to work on. This enables you to work on your embroidery needs in a space just for them. You don’t have to worry about finding an appropriate space that may get messy. It’s perfect for any project where you need to add just a touch of extra detailing to make it truly special. Design Editing Features: You get design editing features with this sewing machine that allow you to edit your designs to the best of your abilities. During the editing process, you can not only rotate your images but you can also mirror your images and decrease their sizes to fit your projects and crafts. Be it custom T-shirts or fun costumes, this feature really comes in handy for most projects that you want to add a bit more personality too. Computer Connectivity: You also have the ability to connect the Brother SE425 sewing machine up to your computer. This allows you to easily import designs from the internet and update your machine without any hassle. Automatic Needle Threader: The automatic needle threader takes the stress out of having to thread your needle to begin your projects. This is one of the absolute best features for many users due to the time it generally takes to thread the needle, without spending it on threading you have quite a bit more time to actually work on your project. Built-in Tutorials: Learning a new machine can sometimes be a stressful experience, the built-in tutorials will show you how to use the Brother SE425 and all of its functions. You will learn how to use it best for sewing, quilting, and embroidery. The tutorials are right there on the LCD touch screen display for easy convenience. iBroidery.com Compatible: You can go online to iBroidery.com and choose any designs you like from the thousands of licensed and limited edition downloadable designs available on the site. All you have to do is find the one(s) you like, purchase it, then use it. The machine is not just easy to set up but also easy to use. Once you set it up you can do everything else with relative else. This includes everything from changing the thread to switching functions. You’re even able to sew without the foot pedal. Due to this being a computerized sewing machine, a basic understanding of technology is needed but even for a complete novice it is pretty easy once you get the hang of it. Even if you are a beginner you can easily use this machine, the built-in tutorials help make learning a breeze and watching other tutorials and videos online will also help. While the foot pedal can be sensitive it is important to remember that you can change that to suit your particular preference. You also need to keep in mind that it may take some getting used to if you haven’t used a similar machine before. The presser foot on the Brother SE425 is not adjustable, that being said it is easy to use. With this machine you get 7 presser foot options, which easily covers all of your various basic sewing needs. The included feet are buttonholes, overcasting, monogramming, zipper, blind stitch, zigzag, and embroidery. Each foot has an intended purpose, using the foot for its intended purpose will help to eliminate stresses involved in sewing and simplify the sewing process. It is important to remember that like with most sewing thread tension can be an issue. Remember that if your cloth is puckering all you need to do to eliminate your problem is loosen the thread tension. For more on how to adjust your thread tension see the below video. This particular machine isn’t too noisy but it is recommended to use it when the household is awake or simply use the machine away from the rooms of sleeping children (if you are not in the room next door you should have no problems). You can use this machine while watching the television without drowning out the show, but please remember that the machine, like most, does make some noise and may interrupt quieter shows. The Brother SE425 sewing machine is a durable machine but please keep in mind that it is not a heavy duty sewing machine. I’s main features are for sewers that like customization and personalization. With that being said it can handle everyday bumps and knocks without taking any real damage. This is reassuring when transporting or storing the machine in high cupboards or shelving. The setup process for this machine is pretty easy and it does come with easy to follow instructions. So long as you have a little bit of time and an appropriately sized space for the machine which is close to an outlet you should be good to go! The warranty period for this machine lasts 25 years from the purchase date and covers the machine. The warranty is 1 year for it’s included accessories. The warranty does not cover physical damage or any damage caused by other devices or software. To see more information about what is and isn’t covered please look at the Warranty. Each foot has a purpose when it comes to sewing and will make certain sewing jobs easier. The buttonhole foot, as one might imagine, comes in handy especially for the creation of buttonholes. Likewise, the zipper foot would be used when a project requires zipper work, monogramming for monogramming needs, embroidery foot for embroidery work, and so on. The Brother SE425 sewing machine is a great machine, especially for those that like to make crafts and projects with customization and personality. The machine comes with a large variety of embroidery patterns and stitches, not to mention many more than you can easily download. This particular machine is great value considering all of the features you get for the price you pay. The LCD touchscreen is one of the more obvious advance computer elements of the machine, you can not only make your stitch selections there bit also watch tutorials and follow step by step instructions with ease. While many sewing machines, especially the computerized ones, seem made for one specific sewer type in mind, the Brother SE425 seems to be one that you can use regardless of your status: beginners, intermediate, and advanced sewers are all equally able to use this machine to the best of its abilities.